Amazingwristbands.com is a best place to purchase industry's highest quality custom wristbands, key chains, slap bands, snap bands, 1/4 inch thin bands, 3/4 inch broadbands, 1 inch wide wristbands, rings and much more of 100% silicone rubber made. 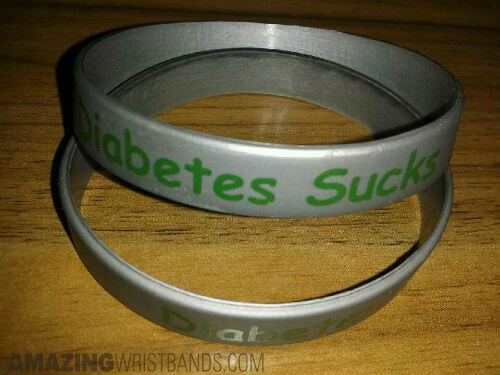 Diabetes Awareness wristbands from Amazing Wristbands are completely unique in nature and these bracelets are made of 100% silicone and will not snap off or slit easily. Whether you want one or hundreds, amazingwristbands.com offers trendy, high-quality and affordable silicone wristbands for any use. Diabetes is a chronic, terminal disease that occurs when the body doesn't fabricate enough insulin which leads to an excess of sugar in the blood. To simply put it, this disease is a silent killer. There are three different types of diabetes: Type 1, Type 2 and gestational diabetes. Recent survey as shown that there are 23.6 million people in United States were infected by this disease and 7.8 percent of the overall population, have diabetes. Of those, 17.9 million have been diagnosed and 5.7 million are living with the lack of awareness. About 246 million of the world population is affected with diabetes. The main cause for diabetes as per surveys suggests that central obesity or apple shape of the body and insulin resistance is the primary cause. An estimated amount of 3.2 million of the world population is killed by this disease every year. There is no early symptom that helps you to realize that you are affected by diabetes. However, signs of feeling thirsty quite often are the commonest early symptom and this doesn't necessarily mean that you are affected by diabetics. This disease is the number one cause for kidney failure in the world. The disease is growing faster and it is high time we wake up to its threat and start spreading awareness with our diabetes bracelets. Show your support for people who are affected by this cruel disease by wearing awareness wristbands with dedicative messages. There are more than 50 ways to prevent or control this cruel disease if in case you are one among the affected parties. Prevention is always better than cure and here are some tips for you to stay healthy and safeguard yourself from diabetes. 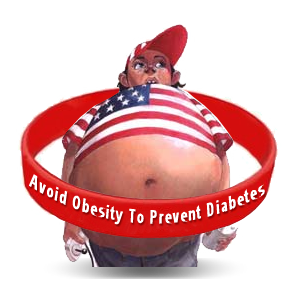 Obesity is the major cause of diabetes apart from other ways. Hence it is very important that you stay put and fit. Body Mass Index is a very popular concept and this is the best parameter to measure one's fitness. Reduce your weight to an appropriately value as per your height- weight requirements. Your BMI value should be between 21 and 25 for a healthy fit life. Exercise everyday and follow a healthy regime. Monitor post meal blood sugar levels regularly to stay in touch. Fitness is not just about exercising. It is about proper metabolism. Eat healthy food and follow a healthy diet. Avoid eating refined carbs. Blood sugar metabolism is also very crucial for following a healthy routine. You have several natural supplements available to assist your blood sugar metabolism. You need appropriate amounts of zinc, magnesium, and chromium minerals in your diet to break down your fat and carbohydrates and enhance your metabolism rate. Want to raise awareness about diabetes? If you, or a family member, or a friend is suffering from diabetes, you can make good use of our rubber bracelets of red color to help raising awareness about diabetes. Unfortunately though this disease has become too common, very few people are aware of how to battle the disease and these kinds of campaigns and awareness programs have become highly necessary to spread the knowledge of how to gather courage and fight it valiantly. 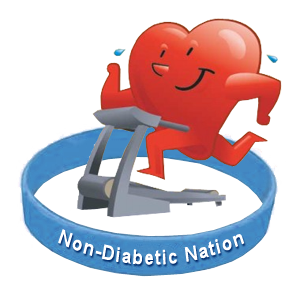 Commonly used messages on diabetes wristbands includes: "Avoid Obesity to Prevent Diabetes", "Support the Cure", "Children's Diabetes Awareness", and "Hope courage faith". You can also personalize; make your own wristbands and request wristbands quote with your own custom message from us.